If you look at my Goodreads updates, you will see that I spent a good part of the beginning of this book in tears, but it was all worth it. Believe me, Young paid me back ten-fold for all my tears with that ending. Pro: Though Sasha died in the beginning of the book, I still felt like I got to know her so well via her letters, videos, and the flashbacks. I could absolutely see why she was Raquel's best friend, and was able to understand what a huge hole was left in Raquel's life without her. Pro: Sick kids will always elicit a strong emotional response from me, but that part was short-lived in the book. Most of this book was a celebration of the friendship Raquel and Sasha shared. It was quite sweet, heartwarming, and endearing. Pro: I really liked the romance. These two were so adorable together. It was a slow burn, but when it finally happened, I was all sorts of giddy. Pro: I LOVED Elijah! I have a soft spot for those, who are able to overcome tough situations or who don't allow difficulty to hamper them or harden them. Elijah's circumstances could have played out in a negative way, but he looked for the silver linings, established some goals, and tried his hardest to work towards them. Pro: The whole story was steeped in hope, and helped along by the auxiliary characters. Young assembled a fantastic supporting cast, who actually gave a lot of support to both Raquel and Elijah. Raquel's parents, her boss, the Reinharts (seriously, that couple put the heart in Reinhart), they were all top-notch. Pro: The ending!!! It is well-known in these parts, that I need a lot of closure, and Young gave me an ending with so many answers. I was jumping for joy at the conclusion, and left with happy tears wetting my face. Overall: I may have started this book with tears of pain, but I ended it with tears of joy. A beautiful and heartwarming tale of love, friendship, and those bonds that last forever. It had been five years since Summer's death. Five year since Owen, Mia, and Brynn were branded "The Monsters of Brickhouse Lane". They didn't do it, but with no leads, the case had gone cold, until Mia unearthed an old test of Summer's, which left her wondering if they missed something. Pro: Oliver had me hooked from page one. I wanted to know what really happened that day in the Long Field, and the way she slowly revealed the pieces kept me coming back for more. Pro: I know people said they guessed the killer early on, but that person was NOWHERE on my radar. When I looked back through the story, the clues were there, but it was by no means obvious to me. Pro: The mood was set really well in this book. It had that pulled-from-the-headlines feel, and all those emotions you expect to precipitate from such a situation - anger, anxiety, stress, sadness, and despair, imbued the story. Pro: Both Mia and Brynn were given interesting side issues to deal with, and those pieces did a great job of adding an additional dimension to each of the characters. And Summer! The full portrait of Summer slowly developed, and the exploration of her effect on each of these young women was quite interesting. Pro: As always, the storytelling was amazing. The bits of the original Lovelorn book and the fanfic written by our trio were interwoven with present day and past POVs from both Brynn and Mia. Each piece was well chosen and well placed to create and sustain the mood, as well as to move the story forward in a compelling way. My only complaint is that I felt like Brynn and Mia's voices were a little too similar. Pro: I would like to personally thank Lauren Oliver for that stupendous ending. There was not a lot of light or hope in this book, but the ending more than made up for all the darkness. 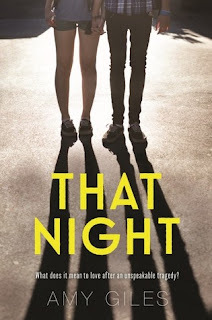 Overall: A compelling mystery, that had me hooked from page one with it's mixed of fandom gone wrong and toxic relationships. That night everything changed. That night they both lost their brothers, but that wasn't all they lost. Jess and Lucas were struggling to heal in the aftermath, and maybe their best bet was each other. Pro: This story was about the aftermath. How a community was broken, and how they were trying to pick up the pieces and move on. There are so many different ways a tragedy can affect people, and Giles explored many of them in a thoughtful and sensitive way. Pro: With this book, Giles proves to be a master with grief stories. Like her debut, this one delivered an emotional gut punch. My heart cracked in half for these people, and their pain just emanated from the page. Pro: Watching Lucas and Jess grow, change, and heal together filled my heart with joy. They were able to slowly break through the protective walls they both erected, and the more they opened up to each other, the more they began to reconnect with other people as well, which was a big part of their healing process. Pro: Two side characters I adored and wished we spent more time with were Pete and Mrs. Alvarez. Pete seemed very happy-go-lucky, but his love and concern for Lucas ran deep. There were these little things he did, which only confirmed his dedication to his friend, and I loved him for that. Mrs. Alvarez was the best surrogate grandmother Jess could ask for. She did what she could to help Jess, and filled that grown-up sized void in Jess' life. Nothing but *heart-eyes* for these two. Pro: This book was pro therapy, and the mental health issues were handled well. Pro: The romance was gooey and sweet and I loved it! Lucas and Jess were precious together, and they made me smile until my face split in two. Pro: Endings like this one are what my dreams are made of. It was so touching and hopeful. Seriously, I just re-read it, and I am in tears. It made me so happy! Overall: A heartwarming, touching, and emotional survival story, which focused on the aftermath, the healing process, and the connections that can help people get through great losses. That first one sounds like the movie P.S I Love You. It might be an interesting take on a similar story line. A little, in that we have the voice from beyond the grave, but Sasha's motivations were very different, and that reason gave an even stronger pull on my heartstrings. The tears flowed for the first few chapters. I have a terrible time when characters die, but there was more to it, and over the course of the book, I grew to love Sasha more and more. Elijah is not quite as ethereal as Rev (he dropped wisdom left and right), but he had had a tough life, and was still trying to make the best of it, even though he didn't really have a lot of support in the past. I liked him a lot. Yay for the good review of Broken Things! I am really excited to get my hands on that one. I just love Lauren Oliver. Great reviews! All of these sound really good, but also tough to read because of the themes, especially that last one. I've tried to read books that involve a school shooting or the aftermath of one, but I'm just not built for them. I should look into the Oliver book though. The shooting is only really mentioned in the beginning. It was more about the healing, and it never got too heavy and was very hopeful. I guess all of these start with something dark or sad, but the authors left me with hope. Thank you for sharing your thoughts on Broken Things. I've been dying to read it because I love Lauren Oliver's Delirium trilogy. She's such a great writer. You've made me even more excited for Broken Things! I've never read anything by her, so this may have to be moved up my list! My favorite LO book is Before I Fall, but I enjoyed this one too. I might have to read Broken Things. That book is everywhere, and it sounds awesome. Great reviews! 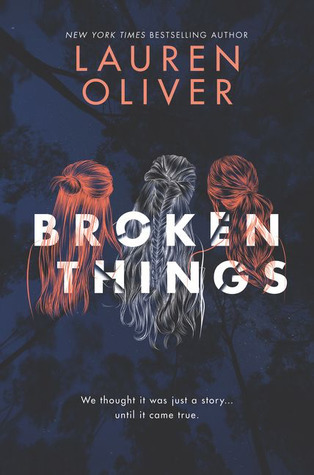 What's interesting is that yours is the second review for Broken Things today - the first wasn't a fan of the ending, and it sounds like you were. Just goes to shows, it's all subjective! I am really curious about that one. I needed a hopeful ending to that story, because it was so dark. I know some people weren't pleased with the ending of the mystery, but it didn't bother me. I definitely need to read Broken Things, I really want to know what's going on! I found it really interesting the way she wove the fictional world into the real world. The Lauren Oliver book sounds so good. I've been meaning to try her books for a while now. This one might end up being my first. Great reviews! Her books have all been solid reads for me. This wasn't my favorite, that is Before I Fall, but I still really enjoyed it. 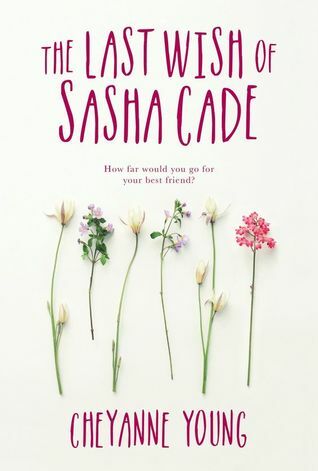 Sasha Cade sounds REALLY good- I don't think I'd even heard of it but wow, sounds like a really emotional book in the best of ways. That Night I hadn't heard of either, but I HAVE heard great stuff about the author and one of these days I am going to need to read her stuff for sure. Also, I am glad you liked the ending of Broken Things! I didn't, but I did at least like that it ENDED, you know? Great reviews, glad you enjoyed all of these so much!! Amy Giles debut was so powerful. It was about child abuse, so, how could it not be. That Night was a quieter book, but appropriate for the story she was telling. I thought you went 3.5 on Broken Things? Not a total loss. I was throughly entertained by it. I really like the sound of Broken Things. These mystery books always scream fall to me as well. Thanks for the reviews! Oliver always writes these stories with damaged characters, which I find compelling. I found myself fully invested in the story. The LAst Wish looked compelling the last time I saw it reviewed (somewhere- who knows lol) and I'm glad to hear that you enjoyed it as well! It does sound worth gettng, for sure, and yes very emotional I imagine. Broken Things has been on my radar mainly because of Lauren Oliver, and I'm glad to see that it seems to be getting positive early word too. I almost certainly will get that one! Lauren Oliver is one of those authors, who always seems to work for me. Even my least favorite book by her was good. I never regret reading her books. 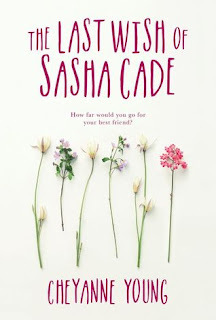 Sasha Cade was my mushy-read. Lots of tears, and a great, big happy ending. I love that stuff. The more I read about Broken THings, the more I want it! I'm SO EXCITED for Broken Things!! I know Vanishing Girls wasn't everyone's cup of tea, but I personally adored it, so I have huge hopes for another mystery by Lauren Oliver. I LOVED Vanishing Girls! I thought the book was fantastic. I am an Oliver fan, and I think she writes great stories. I liked Vanishing Girls more than Broken Things, but it was still very good. Yes, pretty sure book one would have made me bawl, too. Man, it sounds like a heavy hitter. Oh, but your book two intrigues me. I'm adding that one to my list. Fabulous job with your mini reviews, Sam! Sasha Cade starts out sad, but ends really happy, and there was a bunch of other emotions in-between. Lauren Oliver is always a good bet. I enjoy her books, and I liked the concept and the storytelling of Broken Things. Glad to hear the first one ended with happiness and hope despite the sad beginning! When you have no idea who the killer is but then realize the clues were there once you find out, that's the best kind of mystery. Sounds like all of these were great for you! It was a good reading week, and I do expect to be able to look back after the big reveal, and see the little crumbs that were dropped. The killer shouldn't come out of nowhere. Maybe it's because I am not a mystery reader, that I was good with it. I feel like when you have a genre you read A LOT, you are more critical of the way those elements are handled in the story. I like Oliver's writing, and the story was solid for me. I am so happy you liked Broken Things so much. I want to read it. I love my books nitty and gritty so I don't think I would mind the darkness all the way through it but the ending does sound great too. Interesting about the first book you mentioned. I haven't read one about the person left behind when the death of a friend was expected. I found Broken Things compelling and was really happy with it. Oliver writes good books. 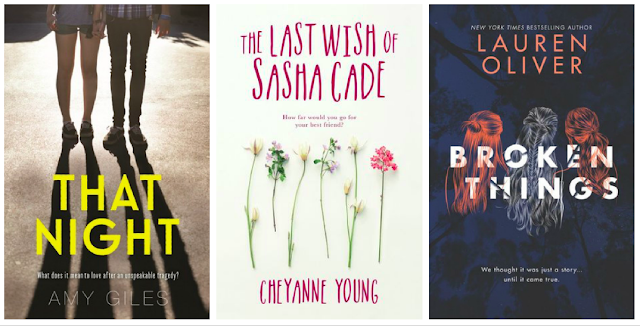 I have a thing for grief books, and I liked that Sasha Cade was about grief, but it was also about celebrating Sasha.